Hurricanes, tornadoes, snow storms, flooding and fires are a part of nature and they don’t usually give you much warning and time to prepare. My wife and I recently went through 3 days and nights without public power and water supply and were unable to leave our home due to a large wildfire. Although I had prepared for a natural disaster of this nature, it still was a great learning experience and I’d like to share our story. My wife was 8 ½ months pregnant with our first child the day a fire broke out of control in the surrounding area. We were actually on our way to visit family when we were turned around by firefighters not far from the house. Our part of the country was extremely dry and we both knew right away the danger we were in. 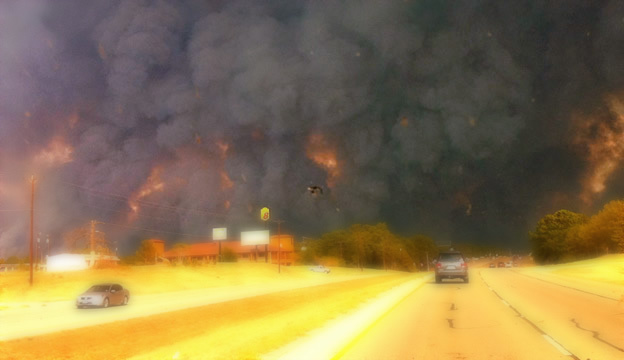 Just a couple days before a fire started in Bastrop, TX that was still out of control and had destroyed thousands of acres and hundreds of homes. We had been watching the devastation and chaos being reported on the television just that morning. I figured I would turn around and exit the back county roads but we were again stopped due to the fire’s quick moving pace. At this point there was no way out so we preceded home to wait it out. It was August and the severe drought had turned the countryside into an endless amount of fuel and the fire proved too angry for the firefighters to get under control. Shortly after returning home our power went out, and with that our water because our water comes from a local facility that runs just our rural neighborhood. We were now trapped at home without A/C on a 110 degree day. Fortunately I had been having my wife pick up 2 large drinking water containers each time she was buying groceries for the past couple of weeks along with canned foods for just this sort of thing. She gave me grief at the time but thanked me after our ordeal had ended. We didn’t have much stored up at that point but it was enough to get us through. The first night wasn’t so bad, other than the heat as temperatures inside the house rose to 90 degrees. We had water and food but that was little comfort to a very pregnant woman. By the 3rd day, we were getting very nervous as the baby could come at any time and the two exits were still blocked. I drove up the road and informed a firefighter about our situation and was pleased to hear that we would be evacuated if she went into labor. Luckily the next morning the fire had been mostly contained and we were able to drive to our family’s place for a nice shower and a hot meal. We were glad to have stored food and water along with some camping supplies to get us through those rough days and nights but it made me re-think my preps – and shortly after, I began building a better plan. Below is a list of items that I acquired should we ever face another event of that kind. Don’t put off gearing up for such an event. Prepare yourself now and feel secure that you and your family can outlast the storm. 3 days and nights was long enough but thankfully that’s all we had to endure. I suggest prepping for at least a week and, if you are able, an entire month as I did. At a minimum, get at least what’s listed below and the more the merrier. You will need one gallon per person per day. Water is needed for preparing food, hydration and hygiene. Pregnant and nursing mothers need even more. Looking back I realize we would have been in trouble if we had our daughter before the fire because we were unable to breast feed and were using formula. A baby on formula uses water quickly. Grab a few gallons each time you are at the store or better yet, make a special trip and stock up. Plastic water containers should last a year unopened, so make sure to get new supplies yearly. I purchased the waterBOB Emergency Drinking Water Storage container for added security. 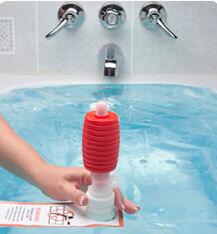 Place it in a bath tub and fill it up. It will hold 100 gallons. Once disaster strikes, even if your water is still running, you shouldn’t trust it’s purity as foreign material and debris can infiltrate and jeopardize the safety of the public water supply. In a natural disaster, securing access to drinking water is a top priority. Another helpful tip you probably don’t know is that your hot water heater is a great source of drinking water. Shut off the supply line to keep possibly infected water out and turn off the power to the unit, if the electricity hasn’t been cut already. There is a hose bib near the bottom that you can use to fill up containers. You will probably get some hard water build up or sludge so having one of those water pitchers with the filter insert would be a great way to clean it. You will want at least 2 servings per person per day. 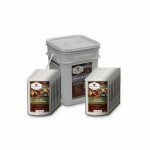 There are some very great long term food storage companies offering a variety of product these days. I went with the WISE COMPANY 60 SERVING FREEZE DRIED CONTAINER. It has a shelf life of 25 years and I tried a couple and they were actually pretty good. Just know that you will need water to cook them in, so again stock up on plenty of water. We lived off of stored canned goods and cooked them on my Coleman Two-Burner Propane Stove. Make sure you have a can opener and also stock up on mini propane bottles. I suggest having at least 2 dozen on hand. I now have 2 large Tupperware containers full of propane bottles and non-perishable snacks like energy bars and romen noodles. Anything that has a long shelf life and is easily prepared will come in very handy. The goal is to get by, not eat well, so keep that in mind when buying food. It might not be a restaurant quality 4 course meal, but you won’t go hungry. Also check out offerings from Mountain House like their 72-HOUR EMERGENCY MEAL KIT. Don’t forget your pets! I now buy an extra bag of food for each of our pets and rotate them from storage to feeding. Again, keep in mind your pet’s water needs when building your water supply. I’m sure you have a home full of blankets and bedspreads so utilize what you have around the house to stay warm. As for battling the heat (as we were forced to), there wasn’t much comfort to be gained there. I did however improvise with what I had at home and would take some ice out of the freezer while it lasted and put it into small baggies for my wife to chew on or place on her forehead. On a side note, the fridge stayed surprisingly cold for the first 2 days so utilize the food in the fridge first and only open the fridge to get supplies. As frozen meats thaw, add them to your daily food requirements. A portable generator would have really been nice during our time without power. If you can afford one they go a long way and provide extra comfort and safety. When the power is out or if there is an approaching storm, information can be a life saver. Knowing what and where something is happing can provide you with vital information and directions to keep your family safe. 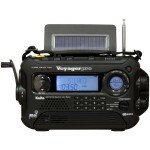 There are several good emergency radios available on the market. Battery powered, solar powered and even hand cranked models. An emergency radio will warn you of incoming storms, and provide you with up-to-date info during and after an emergency. They can also provide a bit of calmness during the storm so to speak by being able to listen to some music as long as there are stations still broadcasting. I went with the Kaito Voyager Pro KA600. This is a great little emergency radio with 6 power options including solar and hand cranking, a built in flashlight and digital tuning for both FM and AM and a bunch of other neat features. Information is priceless so for $80 I found it a great deal. I also picked up the Etón FR160GR Microlink which is a compact hand cranked weather radio for camping and hiking trips. It was around $40 and even came with a USB port to charge cell phones or an IPOD. 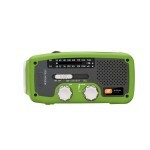 Regardless of which one you get, an emergency radio can give you added time to prepare and just might save your life. During an emergency or natural disaster, the last thing you want to happen is for someone to get hurt and need medical attention because that might not be an option for you. I highly suggest having an emergency medical kit handy while also taking some time to educate yourself on minor emergency care or by taking a emergency medical care class. As always, there are all sorts of emergency medical kits available so there is no reason not to pick one up. I went with a pretty extensive kit because I have first aid training but you should get a kit based upon your own experience and knowledge. 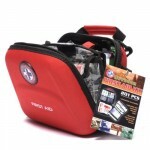 A great starter kit would be one like the OUTDOOR FIRST AID 201 PC KIT. If you have a good deal of emergency and first aid training, you might step it up to something suitable to your abilities. Or you can build your own kit by doing a little online research to find out what a good first aid kit is comprised of. Check out this link to REI’s website to learn what supplies you should acquire when putting together your own med kit. Hygiene is also important. We were in luck because among the large volume of baby supplies given to us by family members were plenty of baby wipes which we used to bathe. Buy a box or two of these wipes and keep them in your kit. Once you are prepped, it is then important to make sure you secure those supplies. Do not just pile them in the garage or pantry, or stuff them in the back of a closet or the attic. These preps are your lifeline, so treat them as such. Store your supplies in an air and water tight container and make sure that they are easily accessible. Once you find yourself in an emergency situation or pinned down by mother nature the last thing you want to discover is that all your preps have gone bad or have been damaged. I use Pelican cases to protect my stash. 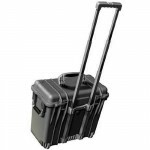 They are extremely durable and will keep your supplies dry and safe no matter what. Save money and buy them without the foam. 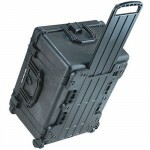 I have both a Pelican 1440 Top Loader and a Pelican 1620 and they fit ALL* of my prep gear. Inside those two boxes are enough supplies to keep myself, my wife and our beautiful new daughter alive and well for up to 1 month, excluding our water supply. * I keep 1 gallon water containers stacked up inside milk crates inside the garage. Natural disasters and other emergencies typically don’t give you time to form a plan or course of action. That is why it is imperative to prepare yourself for these possible situations by acquiring needed supplies and building your emergency stock now, before disasters strike. Not being prepared for such events only adds to your stress level and puts you at an even greater disadvantage to survive the situation. Inside your own home you will find plenty of supplies that will come in handy during an emergency so search around and think outside the box for temporary uses and answers to your needs. We’ve all witnessed in the past decade things like Katrina, the earthquakes in Japan and Haiti, and more recently the tornado outbreak in the Midwest along with flooding and wildfires nationwide. Be proactive. Get prepared. Don’t wait. This entry was posted in Advice, Checklists and tagged bugin, house, survival, wildfire by bobweaver. Bookmark the permalink.